Down a quiet alleyway off Piccadilly, a neon sign announces ‘sushi’. It’s easy to miss even if you’ve been to Yoshino before, so keep your eyes peeled. Like Atariya in Ealing, the secret to this sushi bar’s success over the years has been a guaranteed supply of market-fresh fish; the company is also a seafood supplier. For years, the winning formula here has been a small selection of sushi sets. The colourful chirashi – topped with shredded nori, mange tout and omelette, as well as the expected sashimi slices – has always been a favourite, and didn’t disappoint on a recent visit. The salmon on our nigiri had silky-smooth flesh that melted in the mouth, and the squid was good quality too. Recently, Yoshino’s repertoire has expanded to include wagyu beef teppanyaki and skewers. The seating has also been rearranged, with no pews by the sushi counter. Instead, the dimly lit (and slightly down-at-heel) ground floor is dotted with small tables. Head upstairs if you can: the design is minimal, but it’s generally lighter and brighter. Service remains as polite as ever. After gazing through the sushi display, I decided to opt for a small packet of ﻿Unagi and Cucumber maki rolls﻿ along with my gyoza. This combination is one of my favourites because of how much I love the way the Japanese make their grilled eel. The sweet sauce they use is delicious and I really like the slimy and chewy texture of eel. This compliments well against the crunch and freshness of the cucumber and the slight nuttiness from the sesame seeds that cover the exterior of the sushi rice. This came with a packet of soy sauce inside the packaging but no wasabi. The latter has to be purchased separately for less than £0.50 per packet. As for my order of gyoza, I went for 8 pork gyoza﻿ ﻿with a serving of Japanese rice and homemade curry sauce﻿ for £5﻿. This combination sounded very appealing to me because I was in the mood for a hot meal but nothing 'too hot' (like soup). It was perfect in taste and definitely measures up to some gyoza I've had in Japan. The pork gyoza were everything I hoped they would be - a deliciously seasoned pork filling with added crunch from vegetables or spring onions and a perfectly cooked dumpling skin. It was soft on the top but crisp on the bottom from being pan-fried. I could tell that the curry sauce was homemade because it didn't taste like the generic Japanese curry you'd get at your typical Japanese takeaway joint (eg. Itsu or Wasabi) and was more lumpy rather than completely smooth as the instant Japanese curry packets tend to be. There was a rather large serving of rice given in the bowl, which I couldn't finish mainly because the gyoza were filling enough on their own but also because of the maki rolls I had. I'd definitely recommend this place if you're looking for a quick and cheap meal in the Soho/Chinatown area of London! The food is delicious, tastes fresh and flavourful and the staff were very efficient and friendly. Yoshino is my go-to treat for lunch. But while these dumplings are out-of-this world delicious, it is also a treat that is doable near the end of your pay-packet, as for 6 pork gyozas, this will set you back a measly £3. The dumplings themselves are beautiful; light, delicate, with tasty, salty filling and a wonderful, powerful sauce. Yoshino also offers a range of super reasonably sushi, and they have brown rice options for the health conscious. Top Tip: try to go just before or after lunch rush, as there is often a long queue! Since been told about this ' Dumpling' place I have now been back 4 times in the last two weeks... Its not just that the Dumplings are delicious...(They are little parcels of steamed heaven)... But they are also sooo very reasonably priced ( from £3 to I believe £6 for 12 pieces) I usually go for the (Veg or Pork) Special - 8 Dumplings and Rice and Curry sauce( proper sauce with a kick made from scratch with no nasties) an absolute bargain for £5. Unsurprisingly, there is always a queue but the staff are quick and super lovely. If you fancy Sushi, they have a mouthwatering display of sushi rolls and the most divine crab & cucumber rolls I've had in a while.. All again for under £5. Drinks are Green Tea and Miso Soup of course. If you want to eat in its a bit cramped but it is Soho. You want to eat and go in less than 30mins sometimes and this place is just perfect. We went for dinner here on a Wednesday evening - the restaurant wasnt full but busy enough. Staff were attentive, warm and they answered all our questions, as well as recommending a great sharing menu for two to make sure we tried a good range of dishes. The sushi and tempura was lovely and brilliant quality - and the bill was actually surprisingly reasonable. We have both agreed we will be visiting again - highly recommended! Took my girlfriend there for a special date and was amazed at how great the service and food was. The only downside is having to return to normal food... :( P.S never had a steak so good! After reading a lot of good reviews, I went there yesterday to check this place out myself. The place itself isn't very big and not too cosy as well, more like a diner. The staff is very polite, but unfortunately when I asked them a few questions about the sushi they have, they couldn't answer it. Now about the portions, I don't know actually what is the traditional portion of sushi roll in Japan, but usually when you make a roll and cut it into pieces, you get 6 pieces if it's a regular maki, or 8 pieces if it's a uramaki. Unfortunately in this place you get only 3 pieces per portion. I went there with a friend. Ordered two portions of ebi tempura (3pcs per portion), two portions of sushi with salmon (3pcs per portion), two with spicy tuna (3pcs per portion), some kind of big roll, green tea and an apple juice. The sushi was not too bad, just a bit loose, that means the roll wasn't rolled tight enough. Rice could have been fresher as well. The fried prawns were in a nice color, but with too much of batter (personally I prefer when prawns are just with a little of batter and covered with bread crumbs). Finally the "big" roll. This was a real disappointment. What we got was a thin slice of a big roll, cut into quarters. You couldn't even take it with a chopsticks, because it crumbled straight away. Paid for everything 55£ including the service charge of 7£ as I remember. I'd say a bit pricey, what do you think? yoshino used to run the basement take-out sushi counter at the old japan centre on piccadilly, where the lunchtime queue would extend up the stairs. 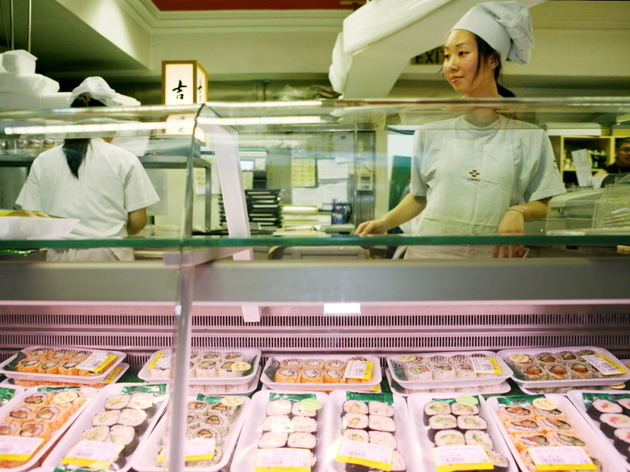 fantastic quality and great value - which guaranteed fresh sushi due to the high turnover. the restaurant is tucked down an alleyway which make it feel like an authentic secret spot. whilst excellent for good-value japanese in that spot of town, the best thing about yoshino is the take-out sushi and sashimi at lunchtime. though portions (and price points - yoshino opted to cut prices and reduce the serving size) have shrunk in the past few months, the friendly, cheerful staff make the food even more enjoyable. you get the same warm welcome regardless of if you're buying a small £2 snack or the lunch order for an entire department.